Sean Ahlquist, Assistant Professor of Architecture at the Taubman College of Architecture and Urban Planning, shared his work on Social Sensory Architectures with students, faculty, and guests at Kresge Theatre on Monday, 19 February 2018. Photo by Christina Brown. Discourse and dialogue continued to flourish at the School of Architecture this past February as Sean Ahlquist took the stage at Kresge Theatre for the third installment of the 2018 SoA Spring Lecture Series. Ahlquist is an Assistant Professor of Architecture at the Taubman College of Architecture and Urban Planning at the University of Michigan. 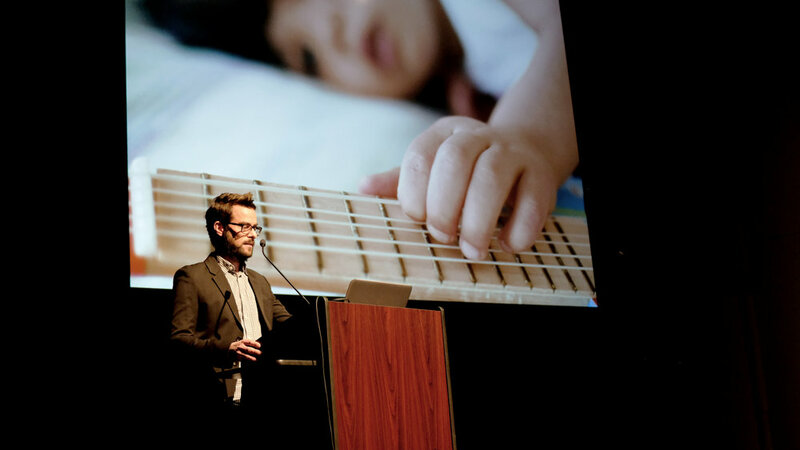 In addition to being an educator, he is the lead researcher on Social Sensory Architectures, an ongoing project at the College that aims “to design technology-embedded, multi-sensory environments for children with Autism Spectrum Disorder (ASD).” During his talk, Ahlquist described an agenda that is as humanistic as it is mathematically rigorous, outlining a three-phase research framework that explores the reciprocity between human behavior and tactile surfaces. Ahlquist and his team explore human-computer interaction through the development of new material technologies, such as tactile interfaces designed to address the learning and social engagement challenges experienced by children with ASD. The project encompasses a wide range of workflows including textile structures and CNC knitting, programming of gestural and tactile input devices, and the design of haptic and visual interfaces for enhanced musical expression. The textiles offer variations in scale and sensitivity to different types of pressure input, from wide sweeping gestures to fine touches. The initial phase of research focused on developing technologies that addressed the specific motoric, communication, and social challenges of Ahlquist’s five-year-old daughter Ara. Ahlquist’s work raises an extremely relevant question about techno-centric attitudes towards architectural practice. Computational design is often criticized for being unable to expand past a certain scale and critique its own basic framework. The pre-lecture Back2Front session on 14 February discussed what the group termed as this “pavilion problem” of digital design and delved into questions of how Ahlquist instrumentalizes the results of his experimentation. One of the most compelling aspects of his work is his interest in prototyping the process as much as the outcome. Ahlquist’s work is novel for the way in which it is situated to navigate seemingly discrete contexts that are, in fact, intricately woven -- digital and physical, technological and social, academic and practice. In his talk Ahlquist addressed, among other themes, the use of pre-stressed tensile structures in his work. He went on to explain how the prototyping process and CNC knitting machine help to create the structures that form the playscape central to the project. He then walked the audience through the various scales of inquiry his research requires: the micro-scale of the yarn, the meso-scale of the stitch, and the macro-scale of the pattern. The overall structure is informed by a decision-making process that spans all of these scales, necessitating a nuanced exploration of how much material is inputted and how it is shaped. When asked whether his research will ever manifest as “full-blown architecture,” Ahlquist admitted that it would not be the best path for the project to undertake. Rather, the team is interested in creating and studying auxiliary, augmented activity in a standard architectural environment; their attempts are directed more towards making these “pavilion” experiences part of a larger, normative architectural context. It is clear, however, that Ahlquist’s work is as guided by an aim to improve lives, as it is by a rigorous intellectual process. As he attempts to create “technology that is engaging, not engrossing,” Ahlquist strives to positively impact those most vulnerable to environmental stimuli, and paves the way towards empowering people in the spaces they occupy. Chitika Vasudeva is a third-year Bachelor of Architecture student in the Carnegie Mellon University School of Architecture.